The Yardbirds have a long and storied history, and were part of the “British Invasion” of bands that broke out of the UK in the 1960s. The blues/rock band split up in 1968 and were inactive for many years until 1992 when founding members Chris Dreja (rhythm guitar) and Jim McCarty (drums) assembled a new version of the band to perform under The Yardbirds banner. The latter-day version of The Yardbirds have gone through numerous lineup changes over the years. Dreja departed The Yardbirds in 2013 due to medical reasons, which left McCarty as the sole original member of the band. While The Yardbirds were once an all-British outfit, the current lineup is four-fifths American with McCarty the Englishman in the band. 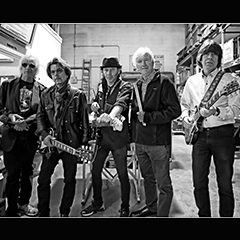 In addition to McCarty vocals, drums, The Yardbirds are now comprised of John Idan on guitar and lead vocals (on critically acclaimed 2003 Birdland Album ), Johnny A on guitar (Peter Wolf, Bobby Whitlock), bassist Kenny Aaronson (Bob Dylan, Billy Idol), and Myke Scavone vocals, blues harp, and percussion. (singer Ram Jam, Doughboys).